This is just a sketch of a personality that I know, Andrew. This isn't exactly what I was hoping for in quality so I'll probably be replacing soon. This is just a sketch of the winged wolf morph from FluffMUCK, Iado. Iado is © of his player and this is posted with his permission. Sorry about the bad scan. This is the first furry piece I ever did, I keep this lion around to see the change in my styles. This is the second version of cmknight. This time I just inked it, and added a background. The inking came out rather bad, sorry. Here my own character Knightfall, is happily walking along. This is a pic of Martin, from Fluffmuck. Once again this is Knightfall, this time the anthropomorphic wolf is getting ready to POUNCE! 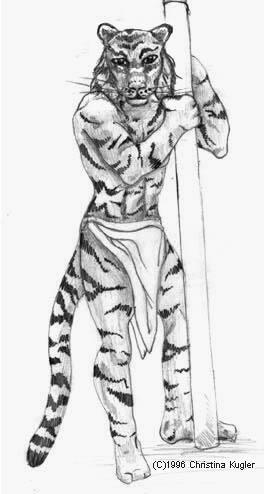 This is just a anthropomorphic tiger I did a while back.